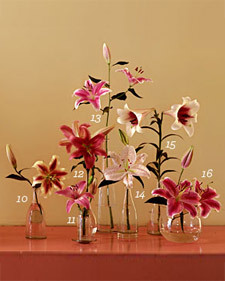 Plants bloom for a few weeks, those in warmer zones before those in cooler ones. 1. 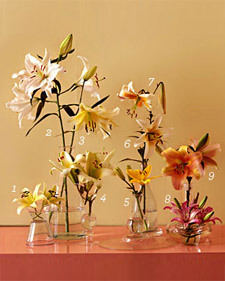 Lilium 'Yelloween,' orienpet; thick, waxy, upward-facing yellow-to-green blooms; light fragrance, strong stems. Zones 5-9, 5 feet tall, July-August. 2. 'Siberia,' Oriental hybrid; outward-facing white blooms, heady scent. Zones 5-9, 4 feet tall, July-August. 3. 'Conca d'Or,' orienpet; lemony blooms, paler tips, and sweet fragrance. Zones 5-9, 5 feet tall, July-August. 4. 'Emerald Angel,' upright trumpet hybrid; fragrant, softly tinted green blooms. Zones 5-10, 5 feet tall, July. 5. 'Desert Flower,' Asiatic hybrid; butter blooms. Zones 3-10, 3 feet tall, June. 6. 'Czar Nicholas,' trumpet hybrid; white with gold, fragrant. Zones 5-10, 5 feet tall, July. 7. 'White Henry I,' trumpet hybrid. Zones 5-10, 5 feet tall, July. 8. 'Sorbet,' Asiatic hybrid; upward-facing creamy-white blooms tinged with raspberry. Zones 3-10, 3 to 4 feet tall, June. 9. 'Sabeneto,' orienpet; peachy flowers. Zones 5-9, 3 to 4 feet tall, July-August. 10. 'Sweetheart,' orienpet; red with orange edges, great fragrance. Zones 5-9, 3 to 4 feet tall, July-August. 11. 'Vermeer,' Asiatic hybrid; pink center edged in paler pink. Zones 3-10, 3 feet tall, June. 12. 'Vice Versa,' orienpet; outward-facing, raspberry blooms. Zones 5-9, 3 to 4 feet tall, July-August. 13. 'Sorbonne,' oriental hybrid; clear candy pink with lighter speckles and white edges, sweet aroma. Zones 5-9, 3 to 4 feet tall, July-August. 14. 'Kyoto,' oriental hybrid; spotted silvery white, very fragrant. Zones 5-9, 3 feet tall, July-August. 15. 15. 'Triumphator,' Oriental cross with Easter lily; deep-pink center, light edges, very fragrant. Zones 5-10, 3 to 4 feet tall, July. 16. 'La Mancha,' Oriental hybrid; pink with darker midrib. Zones 5-9, 4 feet tall, July-August.